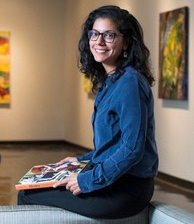 Dr Monica Bravo began in September as lecturer in the Department of the History of Art and the Ethnicity, Race, and Migration Program (ER&M), expanding the range of our teaching and research culture in key areas. Originally trained as a photographer, Monica is a specialist in nineteenth- and twentieth-century American and Latin American art with a specialization in photography in the Americas. Her current book project, growing out of her doctoral dissertation, examines exchanges between U.S. modernist photographers and modern Mexican artists working in painting, poetry, music, and photography, resulting in the development of a Greater American modernism in the interwar period. She completed her doctoral dissertation at Brown University and held a fellowship at the Center for Advanced Studies in the Visual Arts at the National Gallery of Art, Washington DC, last year. This Fall, she is teaching a freshman seminar on “Photographing the Americas” and an undergraduate seminar “Mexican Cultural Renaissance”.